We watch the Superbowl every year. Usually not for the game, since my team hasn't been there for some time. Since 1979. When the Raiders were coached by John Madden and Ken Stabler was a quarterback. And they beat the Vikings. My team. (I don't actually remember that game... but that was the last time we were there). So we watch for different reasons. The ads, the tradition, the company. All great reasons. Maybe best of all is the food. I love game-day, when I can indulge in some of my guilty pleasures - like hot dogs, pretzels and beer. This recipe combines those favorites. 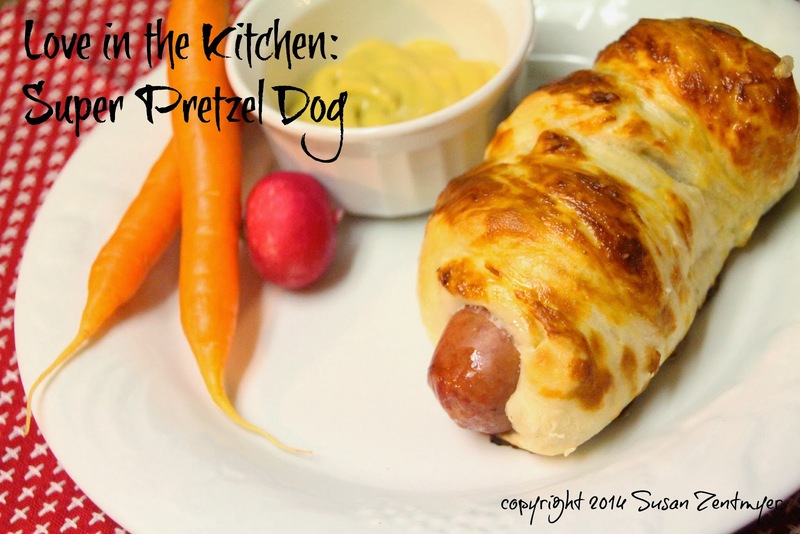 Soft pretzel dough is rolled around kielbasa, sprinkled with salt and baked until golden brown for a grown-up version of pigs in a blanket! Place the first seven ingredients in the pan of your bread machine in the order listed (or as per the directions for your bread machine.) Select Dough Cycle and press Start. Observe the dough as it kneads. After 5 to 10 minutes, if it appears dry and stiff or if your machine sounds as if it's straining to knead the dough, add more liquid 1 tablespoon at a time until the dough forms a smooth, soft, pliable ball that is slightly tacky to the touch. When cycle is complete, remove from the pan and divide into 6 equal pieces. Roll each piece of dough into a long rope. 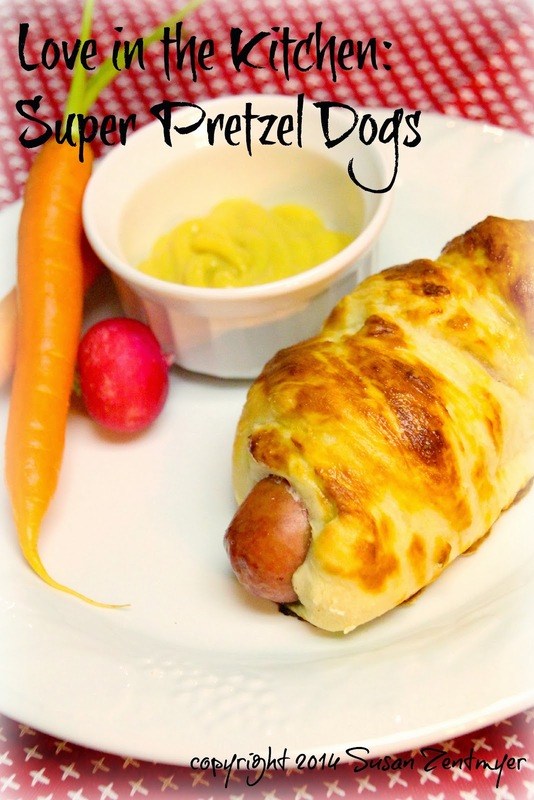 Wrap each piece around a piece of the kielbasa and place onto a silpat-lined baking pan. Stir the baking soda into the hot water. Liberally baste the pretzel dough with the baking soda water (this will help achieve the proper texture). Sprinkle with coarse sea salt. Bake for 20 minutes, or until the pretzel dough is golden brown and slightly crispy. These were fantastic! The pretzels were just the right combination of soft, crispy and salty, and in combination with the flavorful kielbasa, are the perfect game-day food. And as for the Vikings, well, there's always next year. These look awesome for a Super Bowl party. I'd love it if you linked this to our party. 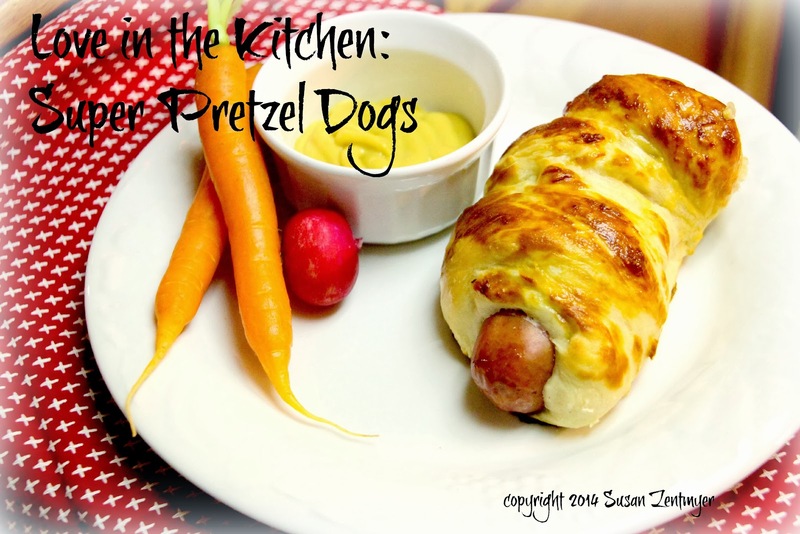 I LOVE pretzel dogs! Well...I love anything with hot dogs. Thanks for linking up with us at Wake Up Wednesday Linky.